Paper Made Bakery: Happy Leap Day! Hey, PMB Peeps! This is Michelle here today, and I want to wish everyone a happy leap day! I have a little bonus card to share with you today. 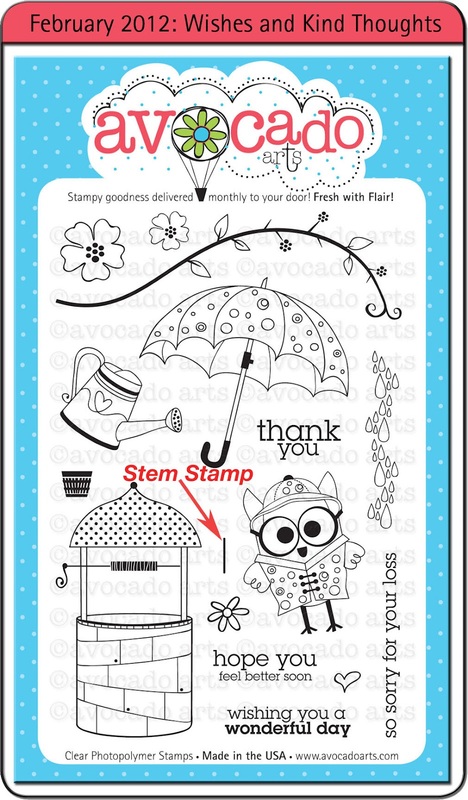 This is actually my fifth project from the February Fresh Baked Kit, and I still have so many Lily Bee Design papers left. I wonder what else I can make... Here is my old fashioned window sill card. I was looking through my stamp set and was wondering if I had overlooked any stamps, and I saw one that I hadn't noticed before. It was a skinny little line that is a stem for the flowers. I decided to design a card to feature that stamp. I wanted a row of potted flowers sitting on a window sill, so I stamped a row of terra cotta pots and stems. I stamped the daisy on patterned paper and cut those out. 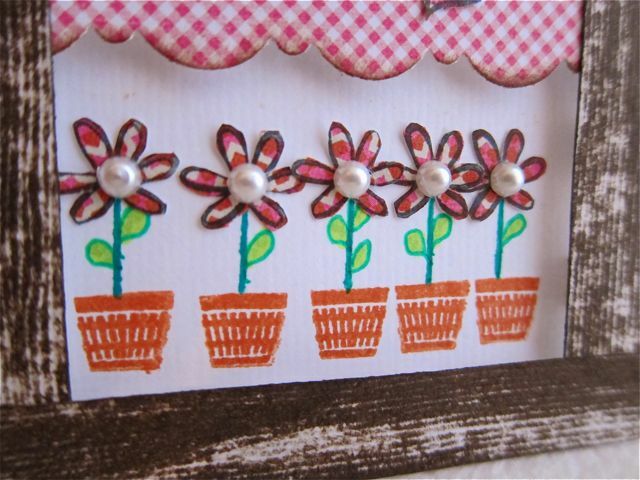 Then I hand drew some leaves and added pearl centers to the daisies. To make it look more like a 3-D window, I inked some white cardstock with distress ink and cut out some strips and popped that up around the border. 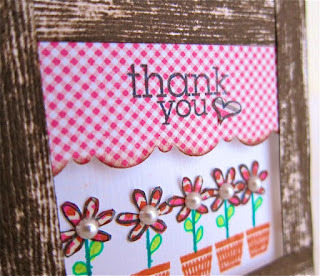 I used a border punch on a scrap of patterned paper to create a curtain and stamped my sentiment on that. I attached the curtain to my wood planks. 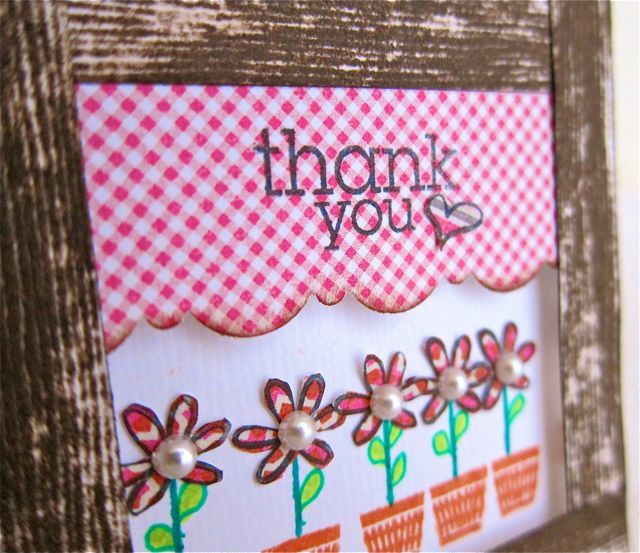 This is a cute little 3 x 3 inch card that would be good to attach directly onto a present in place of a tag. Thanks for stoppin' by today. 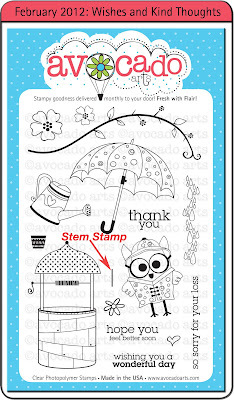 Make sure to come back tomorrow for the launch of the new release kit and a fun giveaway! Darling! I love the window sill idea! 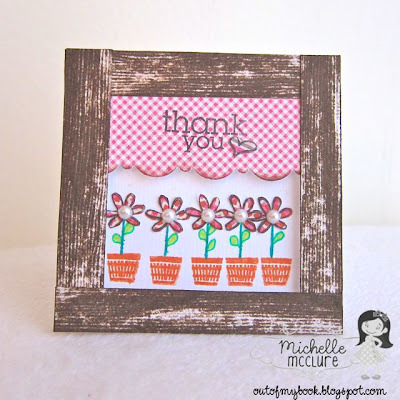 Love this little card--especially cute with the curtains and the stamped daisies!! Love it.